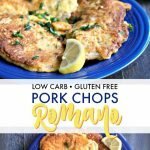 Low Carb Pork Chops Romano - Easy Low Carb Dinner! Low Carb Pork Chops Romano – Easy Low Carb Dinner! 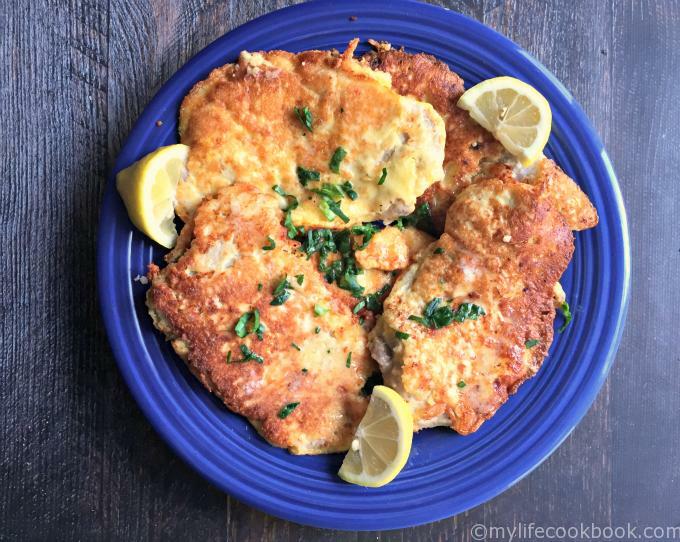 These low carb pork chops Romano are easy to make and deliciously low carb. The perfect week night dinner with only 5.3g net carbs per serving! You might also like this low carb chicken Romano! 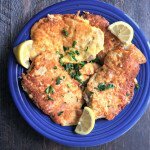 A while back I made some chicken romano with lemon butter and it was a big hit in our house. Today I give you low carb pork chops Romano. Why? Because sometimes it’s hard for me to find thinly sliced chicken breasts and I’m not very good at cutting them myself. And I can always find thinly cut pork chops at Aldi. They put a new Aldi in just 5 minutes from my house so I’m there all-the-time. Anyway, so this is not much different from the chicken recipe but I wanted to show you that it works with pork just as well, which might be easier to find. The pork chops that I buy are very inexpensive and you get a lot for your money. They are boneless, thin cut pork loin that come in a large package at Aldi. There are about 12-15 small, thin pork chops in the package so you can freeze half of it for other recipes. (I often put them in my Instant Pot pork & sauerkraut recipe). Best of all they are ready to go as far as this recipe is concerned. Note: to make them gluten free and lower carb, I dredged them in almond flour first but if you could care less about those things, by all means dredge them in flour. Sprinkle salt and pepper over the pork chops. Next dredge them in almond flour. 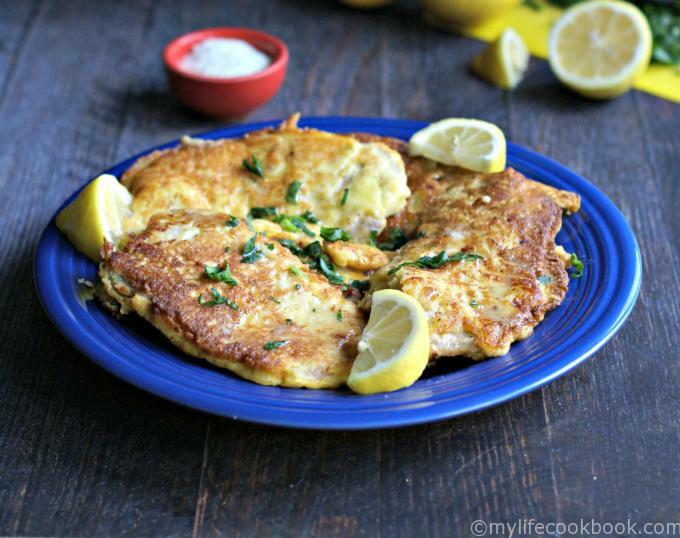 Dip the pork chops in a mixture of egg and Romano cheese and set aside. Make some lemon butter in the pan and then pour over the pork chops. I like to garnish with parsley but sometimes I put it in the egg batter. It gives it more color and parsley is an awesome herb in my book. Packed with vitamin C! Add a few lemon wedges for garnish. 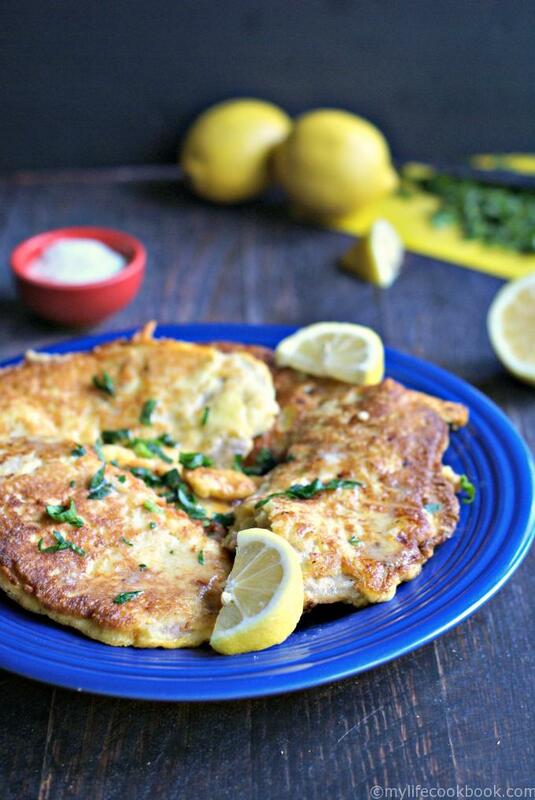 Serve with extra lemon if you are like me and my hubby and love lemon in/on everything. And that’s all there is to it. 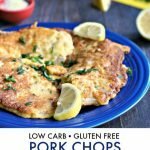 So if you are an avid Aldi shopper, pick up some thin cut pork chops and give this low carb pork chop recipe a try. I’m sure your family will love it. Make sure your pork chops are thin and if necessary pound with a meat tenderizer to make thinner. Mine were about 1/4 inch thick. Sprinkle salt and pepper over your chops. Put your almond flour in a large shallow bowl or dish. Dredge your pork chops in and coat each side. Heat a large sauté pan to medium high. Add 2 Tablespoons of olive oil and 1 Tablespoon of butter and heat until sizzling. In a separate large shallow bowl or dish, beat the eggs and then add the water and Romano cheese. Mix together. Dip the pork chops in the egg mixture. Add the cutlets to the pan and cook until browned on both sides. Move to an oven safe dish. Continue in batches until all the cutlets are done. Bake for 10 minutes to make sure they are done all the way through. If they are thin you may not need to do this. In another sauté pan, melt 2 Tablespoons of butter and the juice of one lemon. Simmer for a minute or two and then pour over the finished cutlets. Sprinkle with fresh parsley and serve with extra lemon wedges.